Precious Sprouts volunteered to organize Michigan’s first Muslim spelling bee Saturday. The competition is one of 10 regional contests taking place across the United States this spring. The world's first national Muslim spelling bee is taking place in the United States this spring and Ann Arbor's Precious Sprouts is organizing a regional competition. 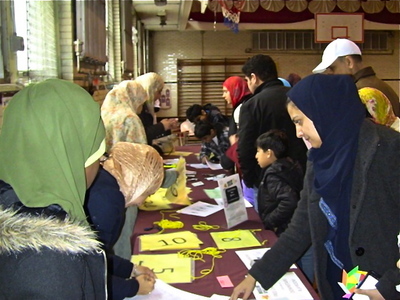 Above, children and parents register for the New Jersey spelling bee in March. A Chicago-based company, TMA Worldwide, owned by Muslim couple Asma and Tausif Malik, launched a national Muslim spelling bee in March to "help connect the Muslim community to the mainstream community." “Muslims are not aware of spelling bees because they are focused on getting their children into engineering or medicine,” Tausif Malik said. Muslim institutions have hosted spelling competitions on a school-wide basis in the past, but never on a national scale, he said. This is believed to be the first national Muslim spelling bee in the world. Michigan was almost left out from hosting a regional contest, despite being home to the largest mosque in the United States, the Islamic Center of America, which opened in Dearborn in 2005. “We were scouting for a school in Michigan but didn’t get one. We were disappointed,” Malik said. He said generally, they looked for schools with large facilities to accommodate the spelling bee competitors and their families. Schools also were encouraged to contact vendors to sell goods at the contests. The other Islamic schools hosting regional events in New Jersey, New York, Florida, Texas, Georgia, California and other states are much larger than Precious Sprouts. Most are well established, have been around for 10 to 20 years and enroll 400 to 500 students, Malik said. But when he received the call from Precious Sprouts, the passion its founders showed for giving Michigan Muslims the opportunity to compete was too impressive to turn down, he said. “We were floored by the statement (from Precious Sprouts) that they would be willing to do it,” he said. “They are small but have big vision. 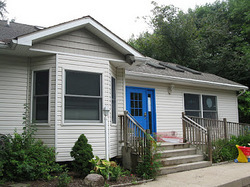 Precious Sprouts, a nonprofit K-2 Islamic school, currently operates out of a small home at 2626 Packard St. Board treasurer and teacher Khadija Chaudry said it was a struggle for the school’s directors to find an adequate facility to rent for the competition with its limited resources. Precious Sprouts of Ann Arbor, a K-2 Islamic school, was founded in 2010. “We really didn’t have the budget to be doing this, but myself and the other founders have been very dedicated to making it work,” she said. The spelling bee will take place, beginning at 8:30 a.m., at Wayne Tree Manor Hotel and Banquet Center, 35100 Van Born Road, in Wayne. Chaudry said she and her fellow organizers are hopeful about 150 people will attend Saturday’s event. There will be a small bazaar with people selling ethnic food, clothing, jewelry and other handmade goods. There also will be candy and prizes for children. She said families are welcome to attend the spelling bee just to watch, if their children are not prepared to compete this year. “Because it's the first year, some families are a little cautious and want to see how it works,” she said. The regional competitions will divide children up into three age categories, 6-8, 9-11 and 12-14. Two winners per age group from each regional competition will move on to the U.S. finals in May in Des Plaines, Ill. Precious Sprouts is a private school with a cooperative business model. The school keeps tuition low for families with the understanding that parents will be required to volunteer at the school each week, Chaudry said. Teachers serve multiple roles as educators, administrators, board members and janitorial staff. Chaudry said this differs from traditional models where board members and top administrators are uninvolved in the daily routines of children and teachers, but then are the primary decision makers. Parents also help around the school and provide classroom support. “We don’t mind cleaning up after the kids. You can see our school principal out shoveling snow in the winter,” Chaudry said. For more information on Precious Sprouts, visit its website. Spelling bee information is available here. Wed, Aug 15, 2012 : 2:50 p.m.
@ Rusty: Totally agree. This is a private organization, and this type of activity should be praised. It seems that some just love to leave hateful comments like throwing some dirty bedrag on the floor. Sun, Apr 8, 2012 : 11:32 p.m. I imagine there might be some Muslim kids reading this article, since it's about a kids event. I'll say to any kids reading this: I just hope you know that most non-Muslims in the U.S. don't think the way a few cowardly, anonymous people here do. It can be really hard to feel like people don't accept you, especially when it feels like they're everywhere. The truth is they're not everywhere, they just seem like it because have nothing better to do. Their hobby is trying to make other people feel bad about themselves. You probably have more interesting hobbies like soccer or spelling bees. The good news is this is just how silly those people are: they think they're making some great political point by criticizing you for having a spelling bee! That's really what they think! You guys are awesome, keep going. So many unexpectedly negative comments here. Please think about what if this was a spelling bee for the Christian or Jewish community; would you object to the same degree? Sat, Apr 7, 2012 : 10:04 p.m.
How does A2.com's moderation policies even allow these idiotic and racist comments to stand here? Maybe they could publish some articles like &quot;Is it true Jews are good with money?&quot; or &quot;Ann Arbor funds art project honoring MLK&quot;. Those should get some good, pageview-generating comments that management so eagerly craves! Does the city's leading media outlet have to profit from our citizen's worst tendencies? Sun, Apr 8, 2012 : 4:50 p.m.
See all those upvotes for the racist comments and the downvotes for the comments condemning them? Yeah. This apple didn't fall far from the free republic tree. Sat, Apr 7, 2012 : 2:18 p.m. The comments here are so predictably ignorant! I guess most of you didn't even bother to read the article-- the organizers specifically state why they are having a &quot;Muslim&quot; spelling bee, in one of the very first paragraphs-- &quot;Muslims are not aware of spelling bees because they are focused on getting their children into engineering or medicine,&quot; Tausif Malik said.&quot; Here he says the idea is to promote the idea of spelling bees in general in a community that normally has no awareness of them and may not even understand their benefits. Host it at an Islamic facility where it is more &quot;in their face&quot; and they will learn and understand and then proceed to the mainstream contests. But I know, most of you see the word &quot;Muslim&quot; on this site and use it as an excuse to unleash all kinds of stereotypes. 'TMA Worldwide, owned by Muslim couple Asma and Tausif Malik, launched a national Muslim spelling bee in March to &quot;help connect the Muslim community to the mainstream community.&quot; as others have suggested why not just participate in the existing national spelling bee? That would do more to connect than to have ones own &quot;parallel universe&quot; spelling bee. I would suggest by forgoing the existing national bee and creating your own bee your doing just the opposite of connecting to the &quot;mainstream community&quot; whatever that means. Sat, Apr 7, 2012 : 11:10 p.m.
Then I guess it's a shame all of your expertise on spelling bees and immigration and assimilation simply goes to waste on a blog, since you've obviously got it all figured out... You're absolutely correct: Every kind of event in this country should be nationalized -- it should be held once a year and by one organization -- and the idea of a local event of any kind is just crazy talk! Sat, Apr 7, 2012 : 6:23 p.m.
bhall, With all due respect I did read the story. Your assumption that I didn't because I didn't come to the same conclusion you did falls nicely in line with the rest of your insulting remarks. The notion that the principles, administrators and teachers in Muslim schools all over America are unaware of a phenomenon that has had a few movies made on it, gets broadcast on ESPN every year and gets covered by national news across the land is hard to believe. Maybe a parent wouldn't know but there is no excuse for school administrators not to know. Sat, Apr 7, 2012 : 3:37 p.m. I would suggest you need to read the story. It's hard to participate in a national spelling bee if you don't know it exists, if it seems strange and not at all like what you're used to and your parents never heard of it. So why not make it easier to get involved in this type of an all-American activity by creating one in a familiar environment in your community? Where I grew up, I guess I never knew people were so actively resisting becoming mainstreamed. My gosh, the Italians had their own church and bingo games. The Poles had their own church and events and dances. The temple I went to had its own singles group! And spelling bees for Hebrew! I just had no idea we were fighting against some imaginary construct and endangering the wellbeing of so many! Is this a Midwestern thing that I don't get like food with jello and an aversion to walking? Sat, Apr 7, 2012 : 2:20 p.m. Sat, Apr 7, 2012 : 12:29 p.m. This may be REALLY stupid question but is the spelling bee for English ? Not a stupid question. The spelling bee is in English because that is the common language of Muslims in the US. There is not a common language of Muslims worldwide. Sat, Apr 7, 2012 : 12:17 p.m. There seems to be a sentiment here that there is something inherently dangerous about allowing people with a shared background/religion to get together rather than assimilating into the surrounding culture. I'm going to assume, then, that people with that sentiment would also like to see the banning of all churches and church-related activities, since that also includes people with similar backgrounds/religions coming together rather than &quot;mainstreaming&quot; into the larger culture. Sat, Apr 7, 2012 : 1:01 p.m. Please see above comment, with link. Sat, Apr 7, 2012 : 12:41 p.m.
How about answering the question poised to you by Rosarium, I would be honored to hear your answer. Sat, Apr 7, 2012 : 10:50 a.m.
Love spelling bees, but you don't mainstream a group by having a muslim or a jewish or a catholic or other 'only' designation event. you mainstream by showing tolerance and respect for other ideas and participating in your community. take part in the community or invite the community to you. this article was less about a bee and more about 'hey, look, we are just like you. the principle shovels snow.' it takes more than that. way more. Sat, Apr 7, 2012 : 1:57 p.m.
As pbehjatnia noted, you don't mainstream a group by holding your own event. In addition to this, what would be the headlines and comments if an organization held a &quot;White only&quot; spelling bee. While I know I am replacing race with religion, but we allow segregated groups to hold their own exclusive events. This is tolerated, but only further separates our great nation. Would it not be better if Precious Sprouts of Ann Arbor simply held a spelling bee. I would assume it could attract the same individuals, but would not divide everyone. These specialized organizations that hold their own events are what continue to divide this country. Sat, Apr 7, 2012 : 12:56 p.m. The Boy Scouts might allow girls, but they certainly do not recruit them. The exception proves the rule. Sat, Apr 7, 2012 : 12:42 p.m.
Actually, sh1, the Boy Scouts do recruit girls. I am female and I was a Boy Scout nearly 20 years ago. I was part of an Explorer Post. Sat, Apr 7, 2012 : 12:10 p.m. So you also must believe Boy Scouts should recruit girls.